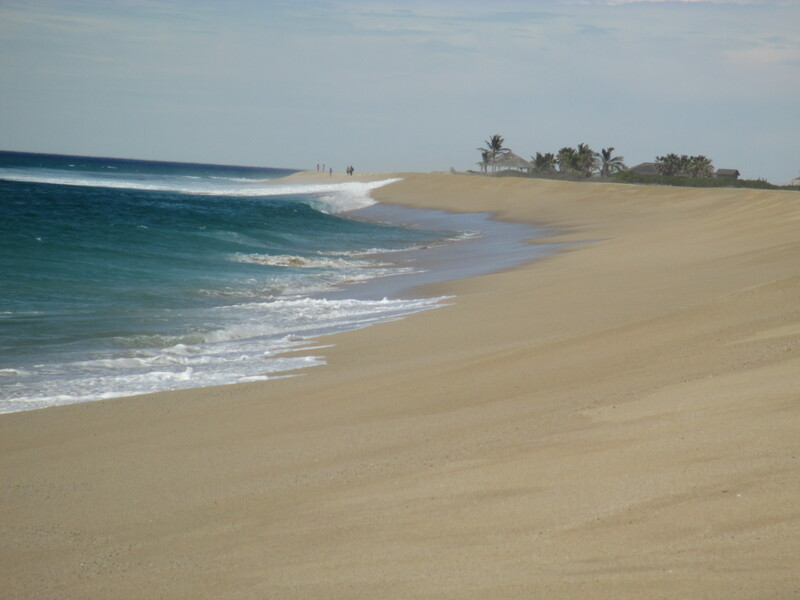 On a long, wide, sandy beach north of Todos Santos, on the west coast of Baja, Mexico, sea turtles are hatching by the hundreds. Almost every evening in the winter months, another bunch crawls over the sand toward the vast Pacific, as turtles have done for more centuries than you can imagine. These days it’s a little different. They need human help, and they’re getting it from a unique conservation organization. 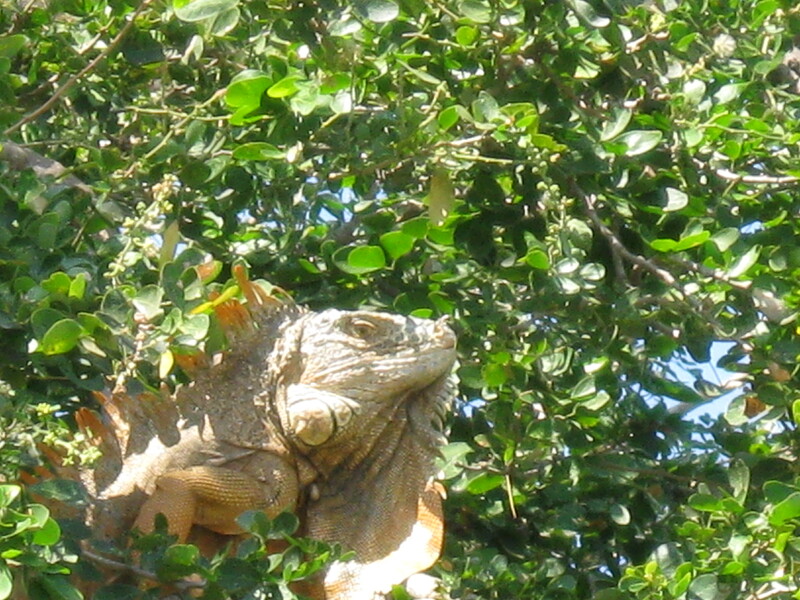 Just past sunset, here at Turtle Camp on Las Playitas, we get to watch it happen. 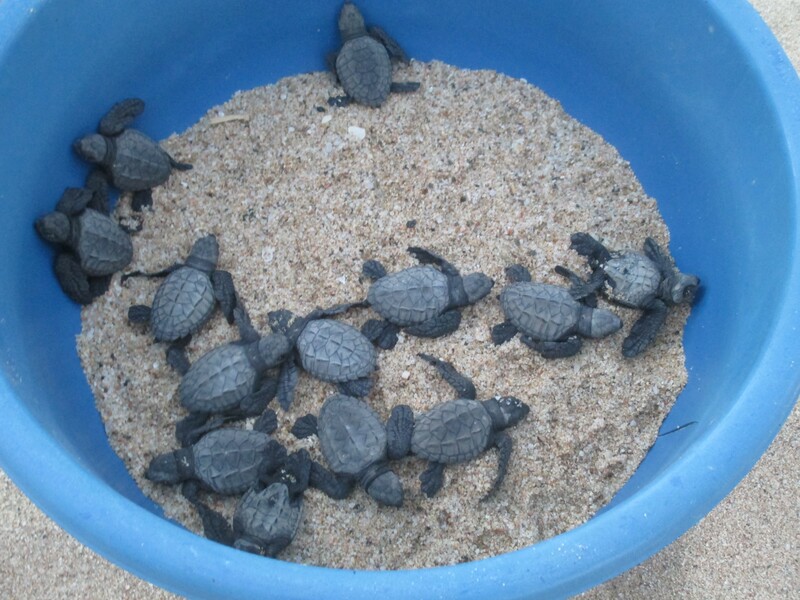 For 55 days the turtles have been in an incubation greenhouse, curled in eggs in warm sand. Those that hatched today are now swarming and wiggling in blue plastic bins, some on their backs waving tiny flippers, others climbing over each other. Where are we? What happened to that cozy, quiet, soft place? What is this booming sound, calling me into thunder and foam and danger? It’s irresistible! Let’s go! Or so I imagine their reactions to be. Volunteers who’ve been watching over the eggs kneel by the bins and explain to visitors that this is the only place in the world where turtle eggs are collected from their nests and kept safe in a greenhouse until they hatch. When they stagger out, they’re held in the bins until sunset and then released onto the beach to find their way into the waves. These little guys and gals are incredibly vulnerable, and darkness shields them from eager predators like the gulls now circling above us. 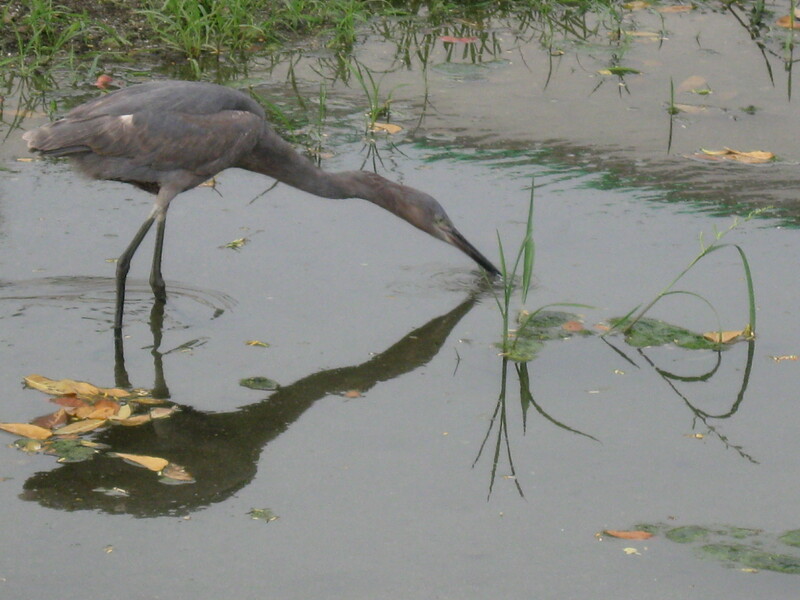 Even so, most will become snacks for birds and sharks or be trapped in nets and drown. 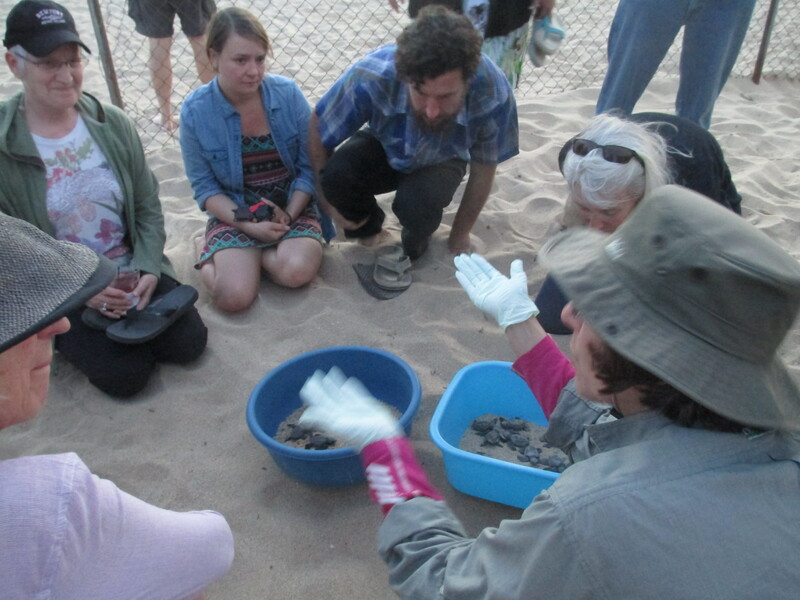 Some evenings as many as 100 turtles are released. Tonight there are about 25, all of them Olive Ridleys. 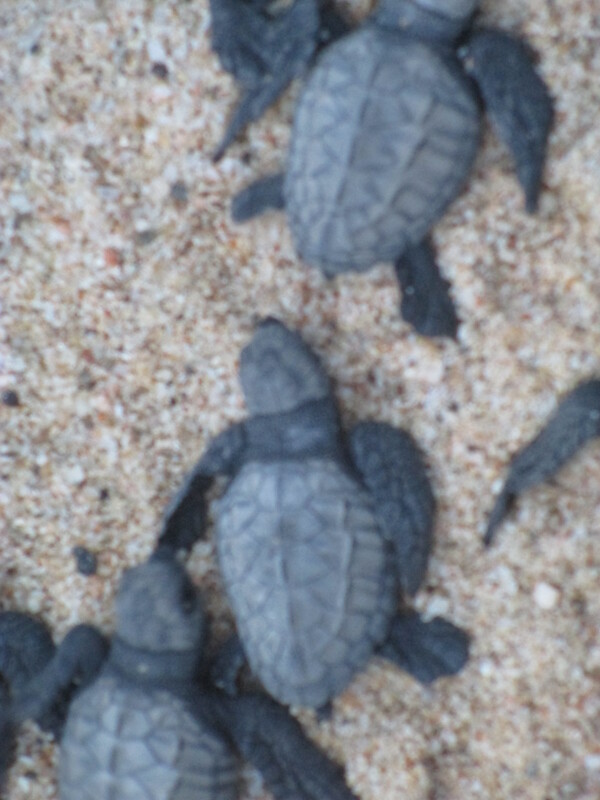 Leatherbacks, the largest sea turtles, hatch here too. They’re found in every ocean and are the most endangered, 90% gone. Amazing fact: when these Olive Ridleys, those who survive, reach sexual maturity ten years after wandering the world, the females with eggs will return to this exact beach to nest. Even more amazing: Leatherbacks come back sixteen years later. I’m hoping enough of them live that long. The mothers drop the eggs, cover them up, and waddle back into the ocean, and the eggs wait, prey to the dangers of ATVs, construction, and any creature interested in dining on turtle eggs—lizards, dogs, birds, humans. The temperature has to be just right, too. 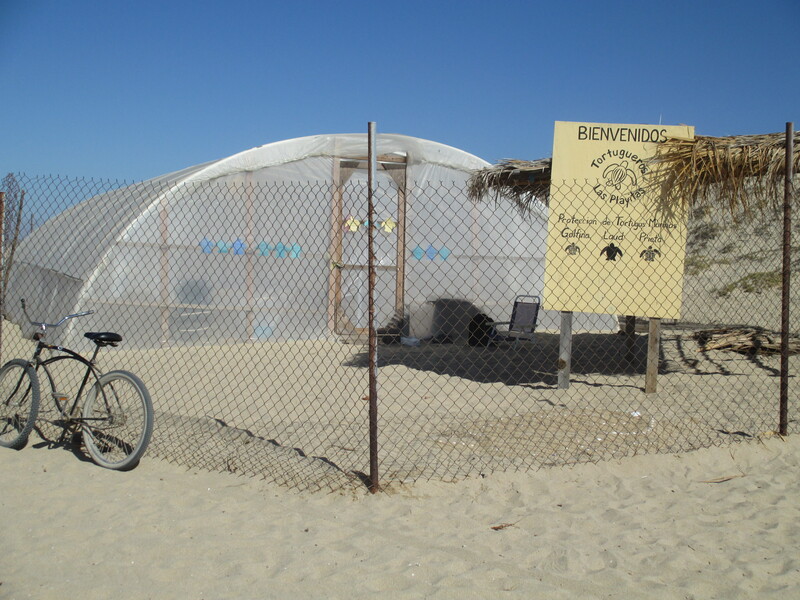 So the volunteers and biologists at Todos Tortugueros give them a hand, collecting the eggs and sheltering them. Now it’s past sunset and the gulls have wheeled away, thwarted this time. Those of us who’ve come to watch stand behind the sharp slope that falls to the surf, where waves rise high, roll, and crash. Once the 3-inch-long turtles are on the slope, they scramble down, pulling themselves forward until they reach the water and are pulled out by the next wave. All except one, who seems confused. He, or maybe she, keeps going the wrong way, or stops as if to get his bearings. He’ll get there, the biologist says. But he doesn’t, and who could resist giving him a boost? 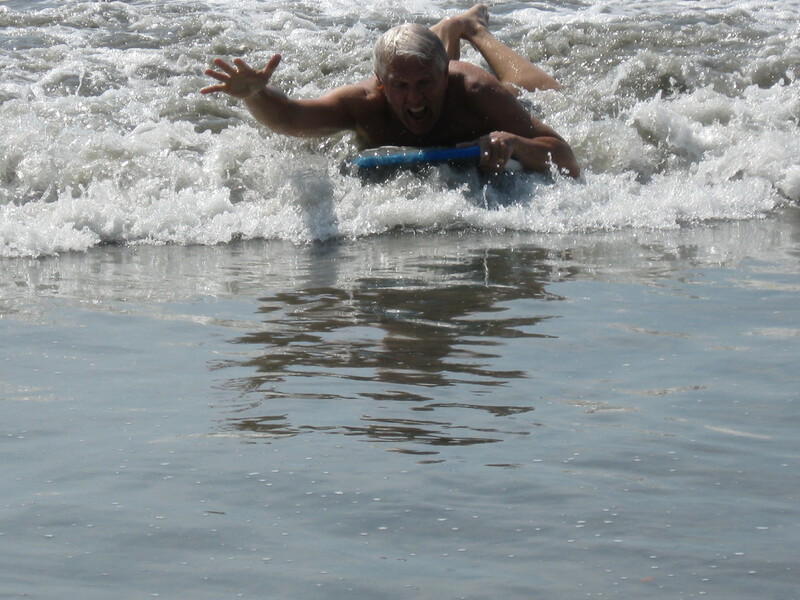 Someone finally lifts him and puts him close enough to catch the wave. And off he goes, into a wild new world that is home. 1. Stroll the walkway on the marina, where fishermen display the morning catch, restaurants serve grilled seafood on the beach, and shops sell a thousand kinds of souvenirs, not all of them tacky. 2. Browse the Mercado Central off Avenue Juarez. It’s a huge covered market selling fruits, vegetables, honey, vanilla, meats, cheese, chicken feet, purses, shoes, clothing and much more. This is a glimpse of local life. Look for the Virgin of Guadalupe statue, and the tree growing through the ceiling. 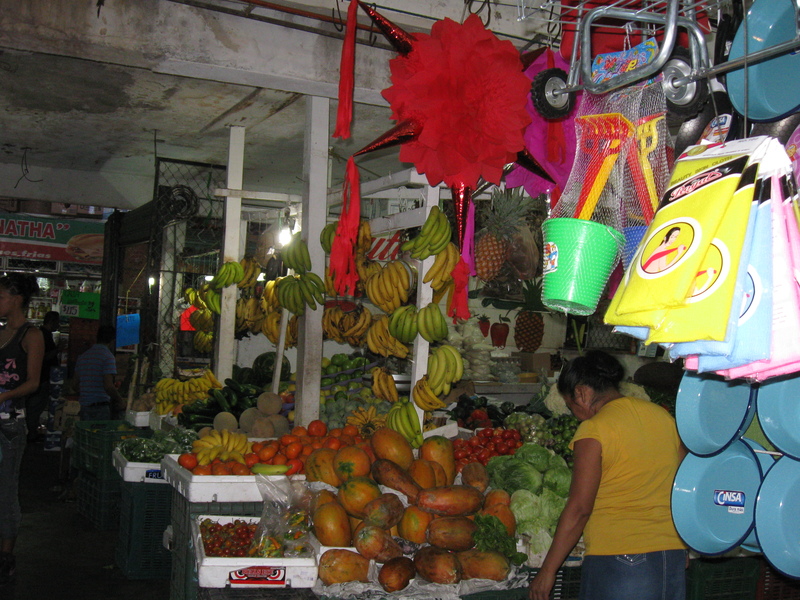 The nearby outdoor stalls along Los Mangos and Los Tamarindos are interesting, too. 3. Buy a fresh, sweet papaya the size of 2 footballs, right off the truck. 4. 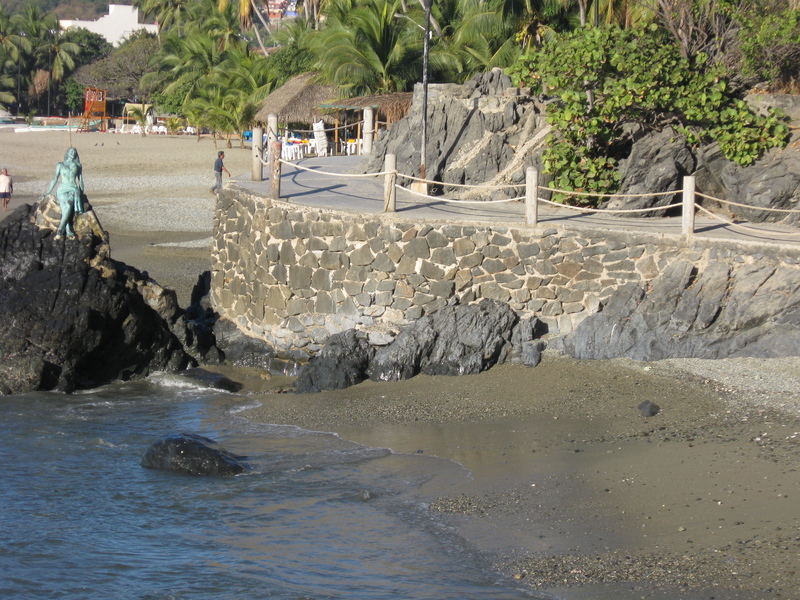 Walk the curving waterside stone path between town and the next beach, Playa La Madera. It’s lighted and has inset benches along the way. There are lovely views of the bay and even a mermaid on a rock. 5. 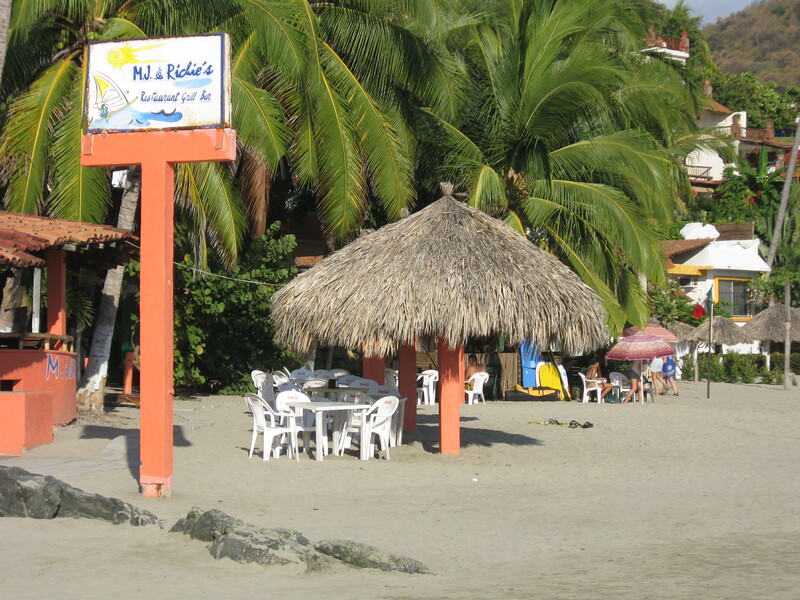 On Playa La Madera, sit at an umbrella table on the sand at La Bocana, formerly M.J. and Richie’s, and munch on their good guacamole and chips. Maybe include a cold beer with lime and salt, perfect in 80-degree weather. 6. Borrow, buy or rent a boogie board and ride the mostly gentle waves. 7. Dine well at Bistro del Mar on Playa La Madera. The food is expensive for this area but excellent, and the service top-notch. 8. Hang out on Playa La Ropa, the much bigger beach beyond. This is the place for parasailing, jetskiing, and other water sports, and there are numerous hotels and worthy restaurants. The Tides and Club Intrawest are pricey, but the food is worth it. 9. 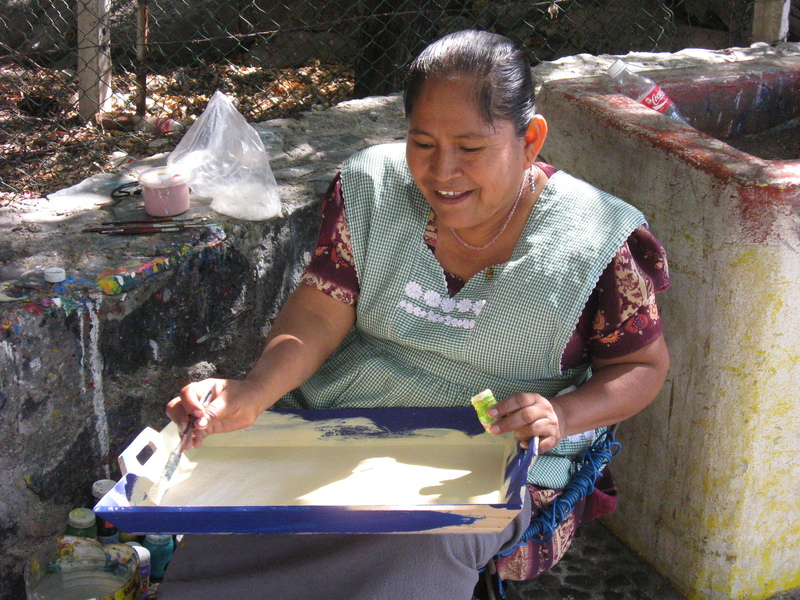 Buy a souvenir from one of the vendors in the myriad stalls on Cinco de Mayo, at the north end of town. Mingled with a lot of junk and t-shirts are some beautiful things; I’m partial to the painted plates. It’s fun just to gawk at the array. 10. 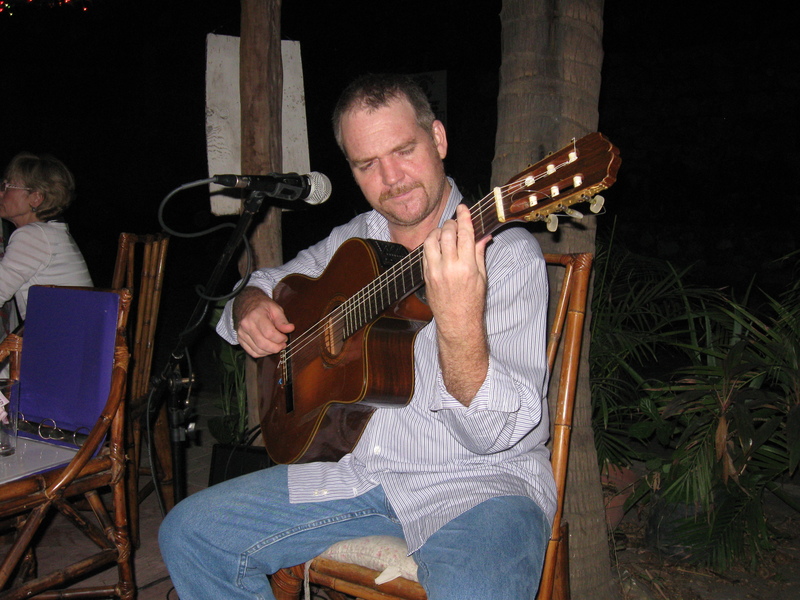 Learn where Eric Reid is playing guitar in or near Zihuatanejo and go to hear him. He is a terrific musician, a virtuoso. A final extra: tip generously. These are hard-working people, and the economy is tough here, too. They appreciate it. Jose greets us with a smile after we’ve gone through the Immigration and Customs routine in the airport. We’re headed for a taxi to our hotel when he says, “Hola, amigos!” and offers to reimburse the cab cost and give us a free brunch if we’ll visit his resort. 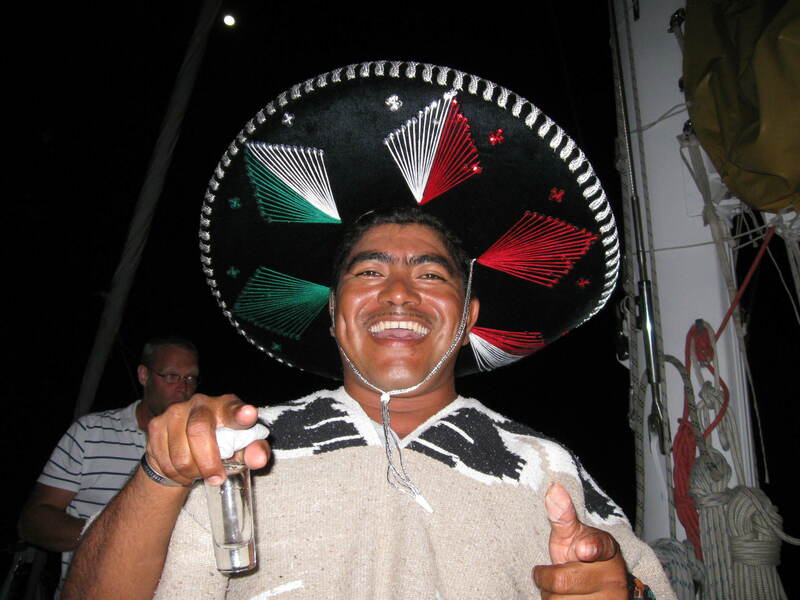 Jose has that friendly Mexican charm, the authentic kind, and we say sure, why not. Then he tells us he needs $10 to reserve our table. In times past, we’d have said no thanks and shrugged it off as another scam, an easy way to lose ten dollars. But now, after a great many travels, we’ve grown more trusting. You might think it would be the opposite because there are lots of scammers in the world, but we have learned that most people aren’t out to cheat us. And experience has taught us to trust our instincts. So John gives Jose a ten-dollar bill and he hands us a piece of paper and says he’ll pick us up on Tuesday morning. Adios, Jose. We’ll see what Tuesday brings. 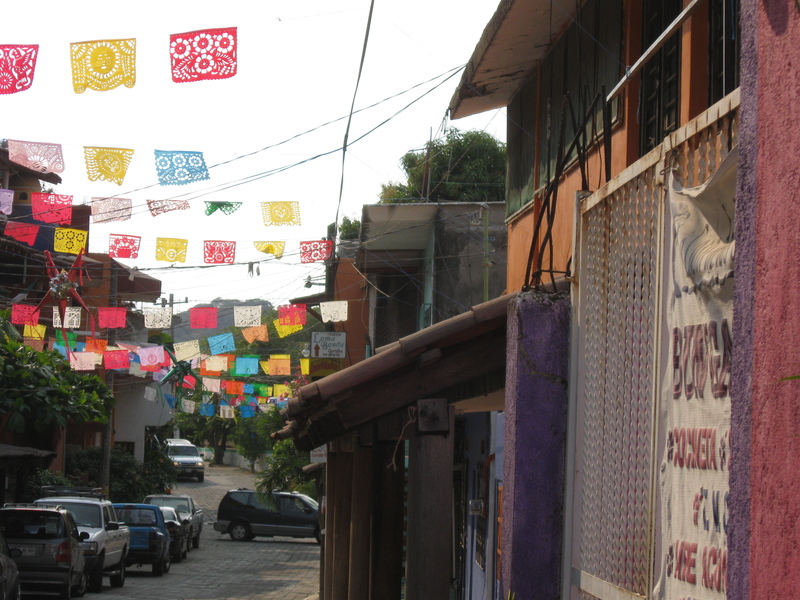 Zihuatanejo, on Mexico’s west coast, was once a sleepy fishing village and now is a sizable town that caters to tourists but retains its own character and busy life. Fishermen still bring the catch of the day to the beach for their customers to inspect. 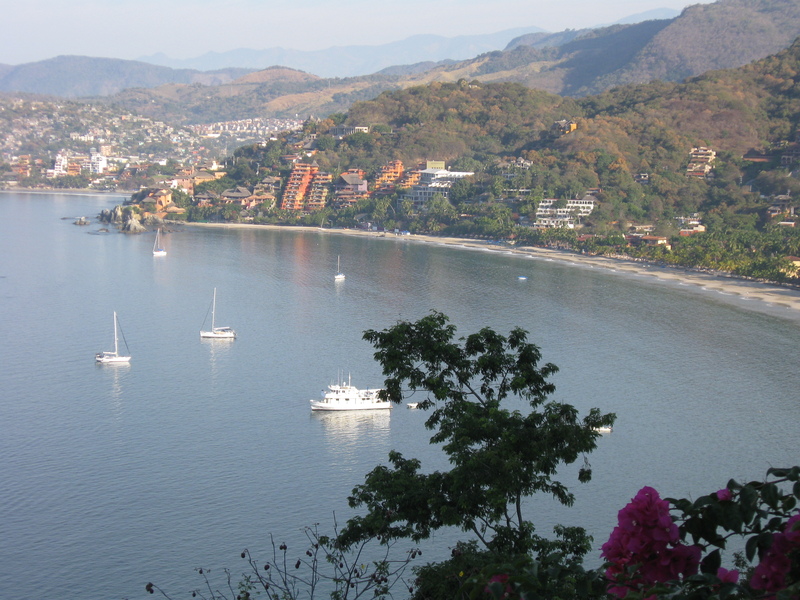 We’re staying above a beach south of town, Playa la Madera, in a pleasant room with a kitchen on the terrace and a partial view of Zihuatanejo Bay. We’ve left the cold gray drizzle for a sunny beach and fresh papayas every morning. Perfection. It’s Tuesday. John and I go down to the road and see no sign of Jose. But I know he’ll be there, and sure enough, a few minutes later he rolls up in a white van and drives us to the far arm of the bay, where a new resort sits against a high hill. 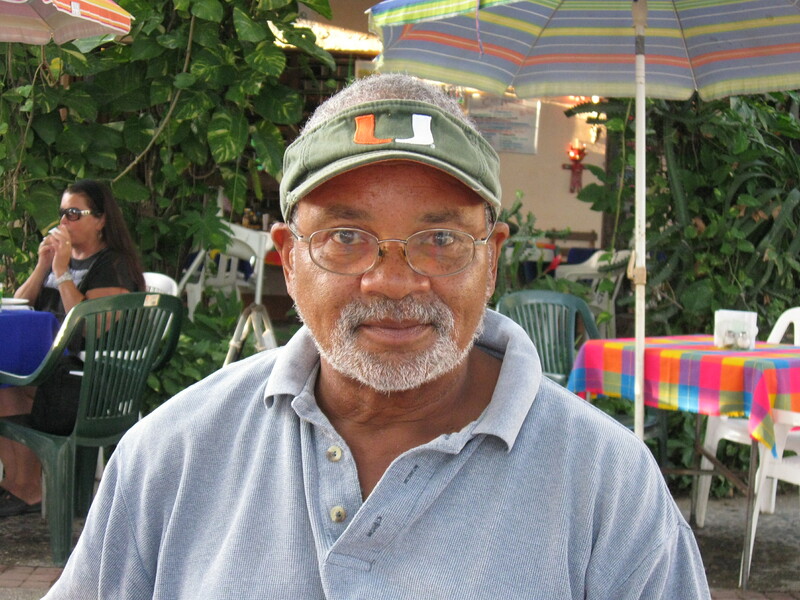 Jose’s English is better than many Americans’–he lived in the U.S. for awhile, he says. In the resort’s restaurant we’re seated with another affable guy who tells us of the wonders of the place and then says, “Let’s go for the important stuff. The buffet.” So we eat an excellent breakfast as we gaze over the lovely bay, sparkling in the sun, dotted with sailboats. We knew this jaunt would come with a tour and a sales pitch; that’s always part of a time-share promo. No problemo. I’m a travel writer and always interested in seeing what’s new. The rooms are well-designed, the architecture striking, the views outstanding. The place is only partially finished, but it’s beautiful. They’ll make us a great deal if we buy a week a year for 30 years (not that I’ll be around in 30 years, but they’ll negotiate). No? How about an even better deal, one we couldn’t possibly pass up? The one thing the genuinely nice salesman can’t understand is that it’s not about the money. Sorry, it’s just not our style, we say, thinking of our little place where laundry hangs on the roof across the street and the Virgin of Guadalupe stands in a niche surrounded by Christmas lights. Beer bottles and plastic flowers are close by a riot of red and white bougainvillea cascading over a wall, and the dusty shop on the corner sells neatly wrapped garlic heads for 80 cents apiece. And we’re a 3-minute walk from the beach. No contest. This tour was a lot more than a paddle around a lagoon, half an hour south of Zihuatanejo, Mexico. It was an education, with a teacher so intrepid and erudite, we learned more about local history, ecology, and plant and animal life than I ever knew, while having fun. Brian Roach is an expert at sharing what he knows. Our little group floated among the mangroves, binoculars at the ready, and he pointed out cormorants, frigate birds, elegant white egrets, flycatchers, doves, roseate spoonbills, and a few dozen others (he knew all the species variations, of course). We were far from the tourist beach scene as Brian guided us through mangrove tunnels and showed us where salt had been gathered. He provided a good lunch on a beach, all the while telling us how the tides work and the birds migrate and what happens in the rainy season. Some years back, Brian and his wife, Kathy Kokolias, came to Zihua from New England to help with a friend’s hotel and boutique. Guests were interested in their 2 kayaks, so Brian started tours. Now they have 28, and Zoe Kayak Tours offers hotel pick-up in a van for trips to the lagoon at Barra de Potosi, Laguna Valentin, and the recently opened wildlife refuge, El Refugio De Potosi. Sailing on a 75-foot catamaran with an open bar and ultra-loud music isn’t my usual preference for viewing the sunset, but this was different. Yes, the beer and other drinks were flowing (“more tequila, anyone?”) and the music was earsplitting, but we oldsters, drinking lightly at a distance from the loudspeakers, enjoyed it as much as the young crowd. For many reasons. 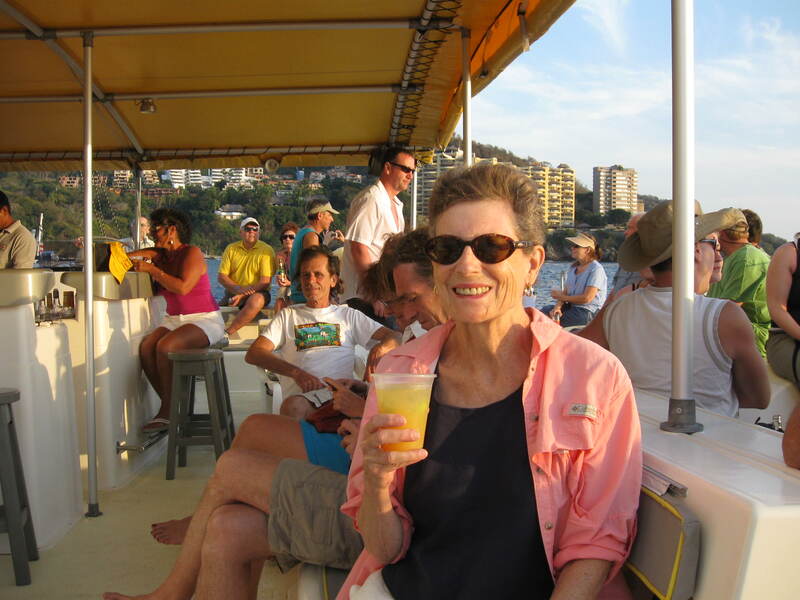 The Picante Cruises catamaran sails out of Zihuatanejo Bay and up the rugged west Mexico coast past Ixtapa, turns around and sails back. It’s a 2-1/2 hour ride over blue waters, and the scenery is spectacular. Cactus grows on cave-pocked cliffs above the pounding waves, seabirds nest on arching offshore rocks, puffy clouds float overhead. One beach is crammed with resorts, another is nothing but sand and a few palm trees. On our cruise, Cap’n Tony pointed out, in his New York accent, various sites of interest–homes of the wealthy, yacht marinas, the foothills of the Sierra Madre Sur mountain range. The good-natured crew showed off their sailing skills, refreshed drinks, served chicken and potato salad, and joked and flirted with everyone on board. They even posed in sombreros and serapes for pictures. Nobody got out of hand and everyone, including me, had a fine time. 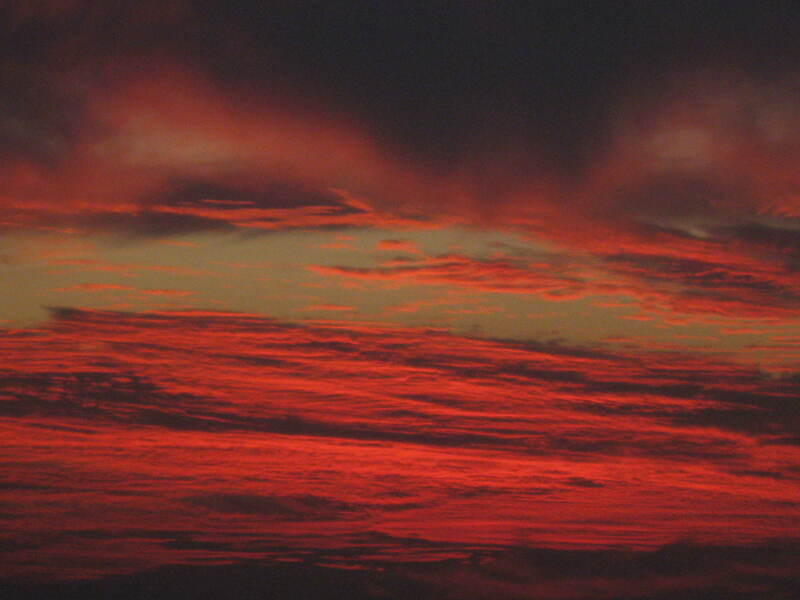 Best, though, was the sunset, gold turning a glorious crimson against the darkening western sky. 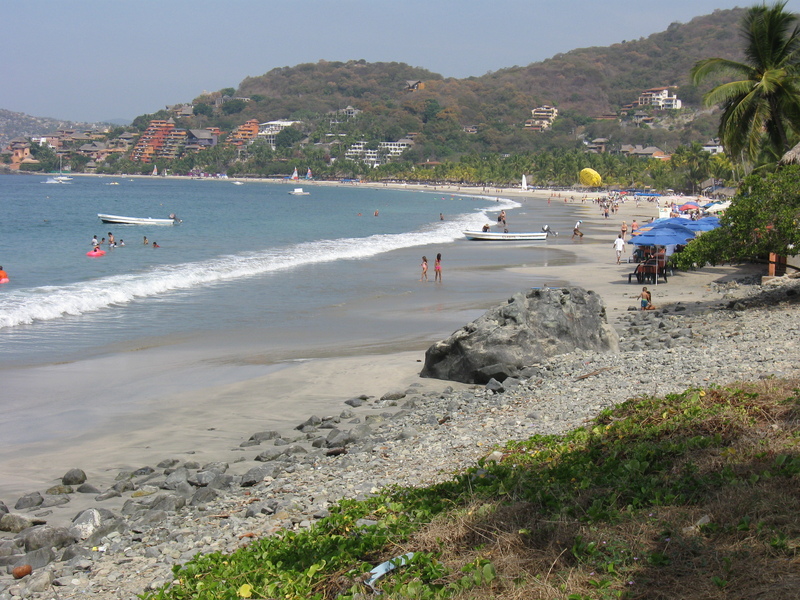 Tucked into the northeast corner of warm, blue Zihuatanejo Bay, Playa Madera is a curving quarter-mile of white & gray sand. 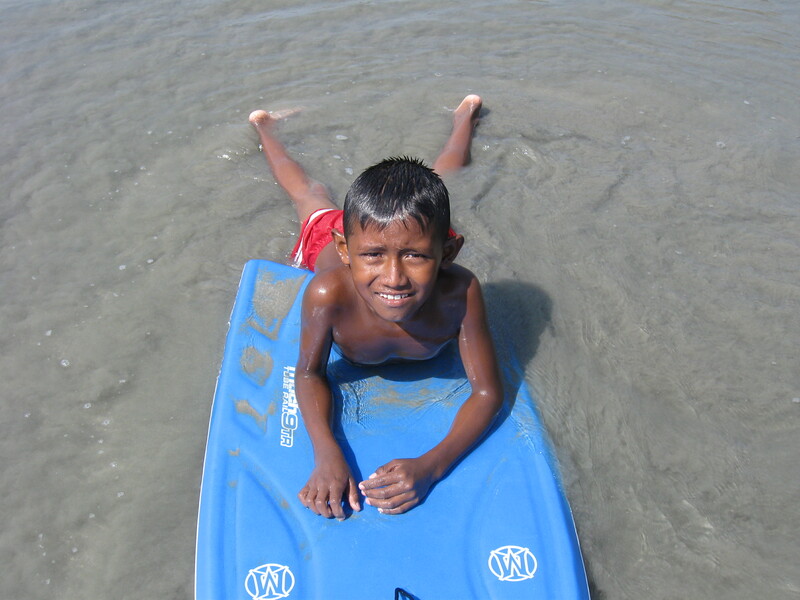 The surf is easy enough for kids of all ages to boogie board. There are a few places to eat; our favorites are MJ & Ritchie’s for lunch and Bistro del Mar for fine dining under the stars. 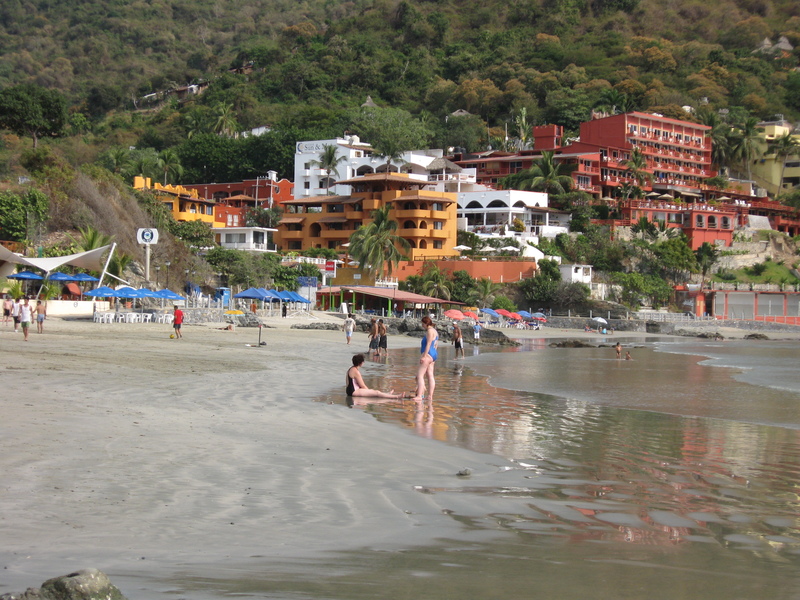 Local families and Mexican tourists help keep the beach relaxed and low-key. Morning joggers can run into town and back along a half-mile path cut through the rocks to the west. During the day, little kids, old folks, and lovers on holiday play in the 80-degree water. In the evening, before sunset, teenaged guys play soccer with spirit, but no yelling. Claro, it’s Mexico. I had to try it. 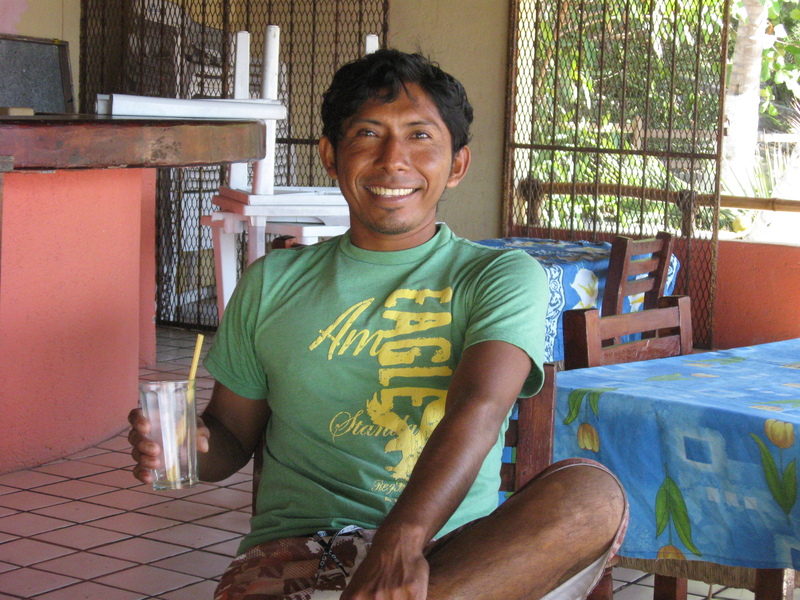 Daniel, the good-looking guy who runs a concession on the beach, rents boards for $5 an hour. We grabbed one and bounded into the waves. 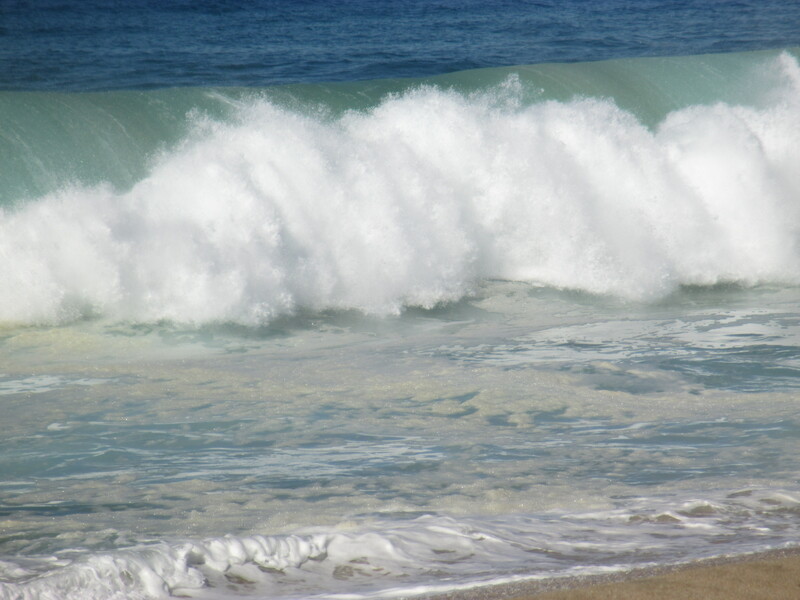 The little cove of Playa La Madera doesn’t get huge breakers, but they were big enough for me. A wall of ocean curved toward me, I flopped onto that board and hung on and rode the top all the way to the foamy shore and fell into the sand. Wow. Not bad for a first time. One more thing I should’ve tried years ago. I had a few more great rides, and so did John, but a little boy was watching with envy, so he got the board for the rest of the hour. What can I say–we’re grandparents. But I’ll be out there again next time, riding beside the surfers.